StarWind is known for their Virtual SAN software solution for VMware, Hyper-V, and KVM. 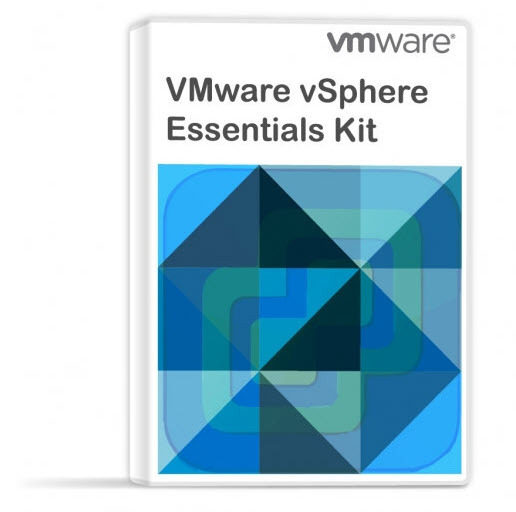 However, there is a new offer, a Linux version for VMware vSphere which is especially beneficial for users willing to save some money on Microsoft Licensing. You don’t have to pay an extra license for the underlying OS as it uses Linux. So this post will detail the news about a new StarWind Virtual SAN on Linux for VMware vSphere. Note that StarWind Virtual SAN for Hyper-V environment is still Windows based as in this architecture you’ll deploy the solution on the physical host already running Windows Server with Hyper-V role active. StarWind Virtual SAN on Linux for VMware vSphere has the same set of features as the one running on Windows. You basically simply deploy a new pre-configured OVF Template, and then you finish the configuration within a web browser. By default, the solution has only a system disk which is really flexible. You can simply add a second disk (should be Thick eager zeroed for best performance) and create size you wish, to fit the configuration to your needs. While you can start with DHCP, it’s best to login to the console and assign a static IP. The product behaves the same way as the Windows-based StarWind Virtual SAN. You need to configure at least two nodes and create a mirror. You’ll need at least 3 vNICs (iSCSI, management, sync) to respect the good practice. Here is a view after the login, you can add an additional account, and also change the password of the root account. Terminal – you have a terminal window where you can go for a CLI. 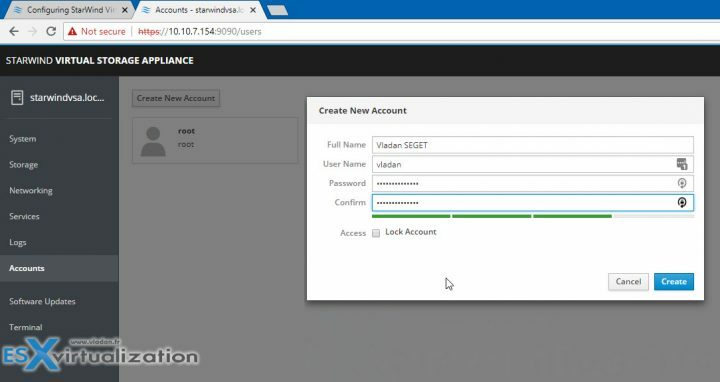 While you can do some basic configuration within the VSA itself, for further configuration of StarWind Virtual SAN you’ll need the traditional StarWind GUI Console you already know from the Windows version. So yes, you’ll need a Windows management workstation where you’ll install a StarWind console to finish the configuration. Here is the overview from the lab showing the first connection (we need to add a data disk, so we have received this prompt). You can then continue the configuration as stated within the StarWind deployment guide. This does not change from the Windows version. 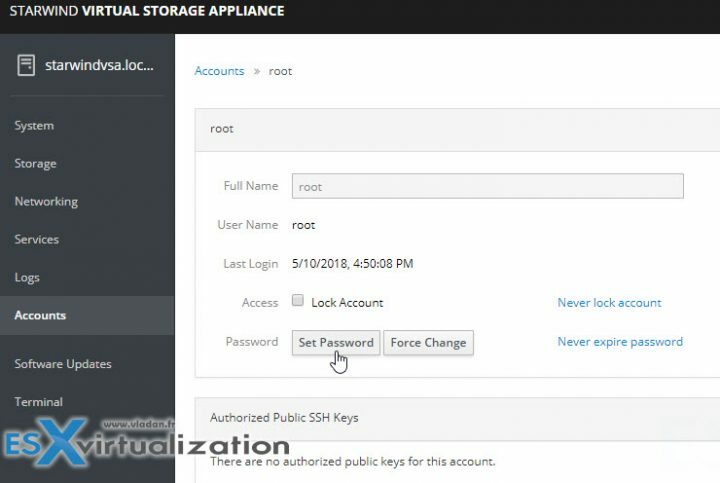 You’ll need at least two nodes to be able to create a mirror and expose this highly-available storage as an iSCSI target to your VMware vSphere VMs. Other then that, there are some recommendations and best practices. A ready-to-go Linux VM installs on the cluster nodes to share their storage resources. Once installed, Virtual SAN creates a fault-tolerant storage pool available to the entire vSphere cluster. Screenshot from the StarWind Virtual SAN product page. As being said, the vMware licensing is based on “per-host” while Hyper-V licensing has different editions – standard, professional, enterprise, datacenter. Those are licensed per node and per capacity. Note: the enterprise edition has the capacity unlimited. And in the datacenter edition, there are unlimited nodes. 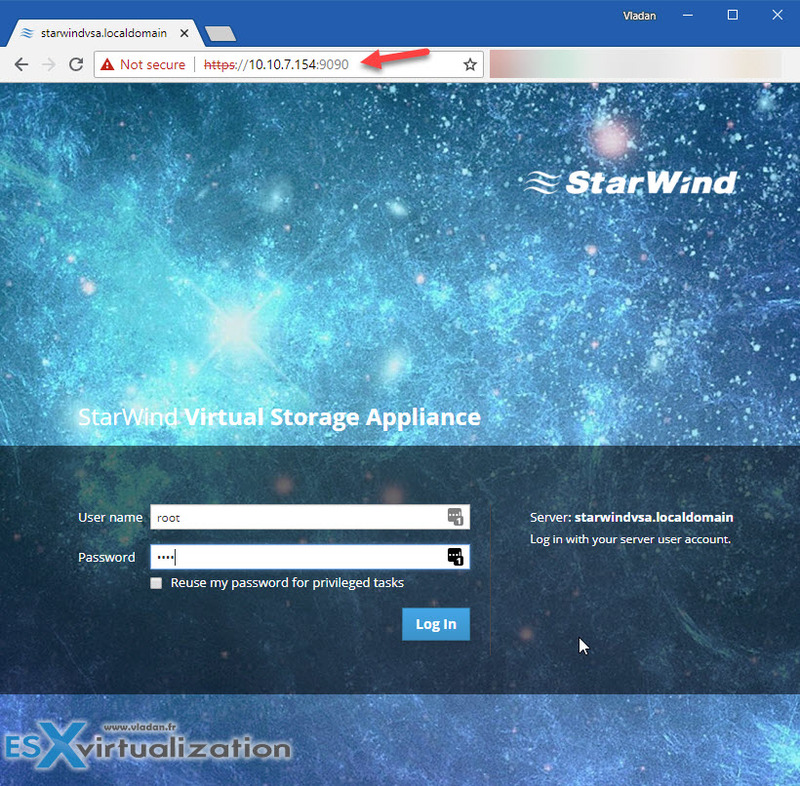 StarWind Virtual Storage Appliance is a very simple and easy-to-deploy solution. The fact that it does not need Windows for the underlying OS is certainly a good news for VMware users willing to create an easy solution without additional spend on Microsoft licensing. With just two nodes you’re able to create a highly-available storage which uses the local disks (DAS) of each server and creates a pooled storage exposed as an iSCSI storage visible by all hosts within the cluster. Hyper-V users did already buy their license when running a Hyper-V cluster so for them, it does not really make sense to have a Linux version. Big FAN of your blog. I read almost every post. Trying to figure out whats the way to go with my SDS Homelab. Would you prefer Starwind vSAN over VMware vSAN? Hi Yves. Thanks for reading my blog. I went for a VMware VSAN, but It’s kind of an overkill for me. Will be reducing the lab soon. (selling some hardware). It really depends on the budget you want to put in and the real need. I’m definitely glad I went for a low power Xeons, indeed. But still, I don’t need that much hardware. But FreeNAS has been around for a long time and you can run FreeNAS as a VM to create a hyperconverge architecture. So not really new for anyone running VMware wanting to save on money. Although I’ve never heard of this product. Is it free like FreeNAS? FreeNAS does not (AFAIK) a high-availability feature. When having 2 nodes, if one node dies, the second node maintains the data store online so your VMs which died with the failed host will be automatically restarted on the second host. Replication of the ZFS for DR purposes, yes, but not High-Availability. Any documentation that you know of, on how to upgrade the Virtual appliances when upgrades are released?